That’s your trusty BATman underneath one of four engines that propel the A380 through the atmosphere. Earlier this week I took a whirlwind 48-hour trip to Frankfurt, Germany to engage in the festivities surrounding the arrival of Lufthansa’s giant A380 to San Francisco. Come on along and check out photos of all three classes, bathrooms, exterior cameras and several unusual touches that make this leviathan of a plane special. 1) There are 425 coach seats which fill the entire lower level of this big ship. Coach seating is tight in a 3-4-3 configuration (with 94 rows! ), however due to the use of new composite materials, thinner seats provide more space, and knee room is not all that bad. Each coach passenger has a touch screen video entertainment system. Seats feel more comfortable than they look in the photos below. Current roundtrip coach fares between SFO and Frankfurt are in the $1300 range for June trips. I’m 6’1″ and still have ample knee room in coach. Cup holder is a nice touch for those who don’t want to lower the entire tray table. Yes, that’s right, Row 94! Last row in coach. 2) There is a distinct separation among classes on the A380– it reminded me of how classes were separated in the movie “Titanic.” For example, first and business class passengers board the plane from their own jetway which leads to the upper level. Coach passengers board from two separate jetways that lead to the lower level. While there are two stairways (in the front and back) on the A380, mixing of the classes is obstructed by gates– coach passengers are not allowed upstairs. This is the gate blocking passage at the rear circular stairway of the A380. 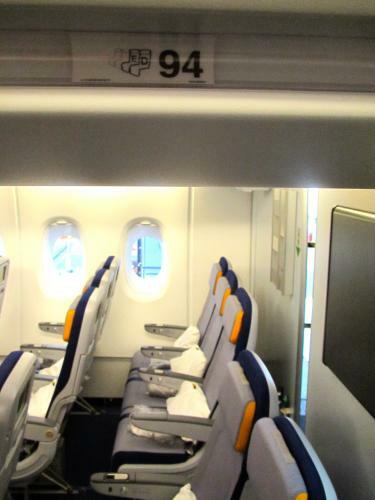 3) Business class seats (all 98 of them!) are identical to those found on Lufthansa’s 747s. Seats are “angled” lie-flat versus “true” or “horizontal” lie-flat for sleeping like you’ll find on United’s flights to Frankfurt or British Airways’ flights to London. I spoke with Lufthansa CEO Carsten Spohr about this and he admitted that the less desirable angled seat puts them at a competitive disadvantage. 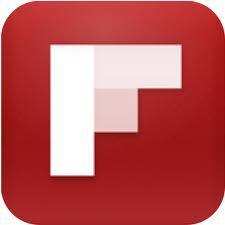 Without going into specifics, he said, “It’s time for us to step up– we don’t want to fall behind in this area. We plan to invest in quality and offer the best business class seat in the world which will be a true lie-flat product. You’ll see it first on our new 747-800’s starting next year.” While Lufthansa plans to swap out the A380 for a 747 on the SFO-FRA route during the winter months, it’s not certain that it will be a new 747-800 that will have the new style seat. 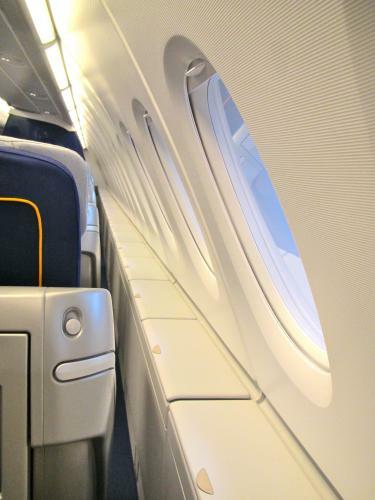 Spohr said that eventually the A380 will get the new true lie-flat seat, but I’m guessing that could take several years. Current roundtrip business class fares between SFO and Frankfurt are in the $7000 range for June trips. One of the things I love about flying upstairs on a Boeing 747 are the storage bins alongside window seats. On this big bird, there are storage bins along all 28 rows in business class. 4) Lufthansa’s first class product is outstanding and offers up several unique innovations such as personal storage lockers (with combination locks), electronic window shades, mattresses, sheets and full-sized pillows placed over the fully reclined, true-flat seat for sleeping, humidified air, extra sound-reducing insulation and gorgeous finishes in leather, steel, chrome and wool. There are only eight first class seats on the A380. Current first class fares between SFO and Frankfurt are in the (gulp) $20K range, but upgrades are available from business class for super elite Lufthansa and Star Alliance fliers. Check out the knee room on the first class seat! A thin mattress is placed over the flattened first class seat and made into a very cozy bed. 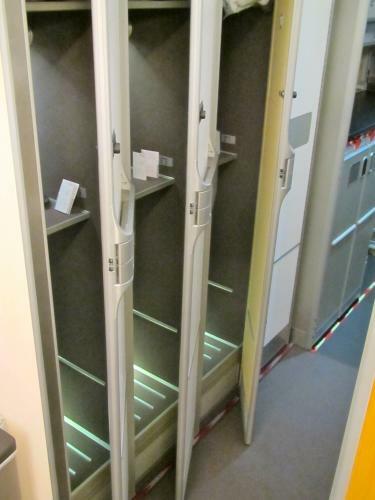 Each first class passenger gets his/her own storage locker with a combination lock. 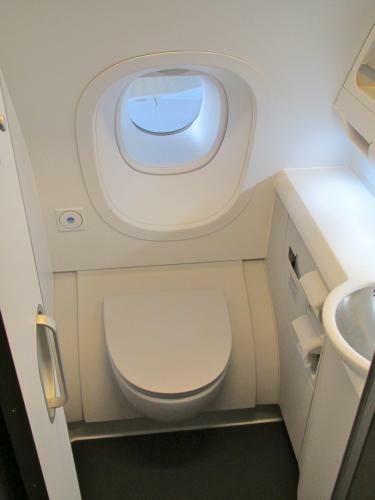 Business class lavatory with a view! 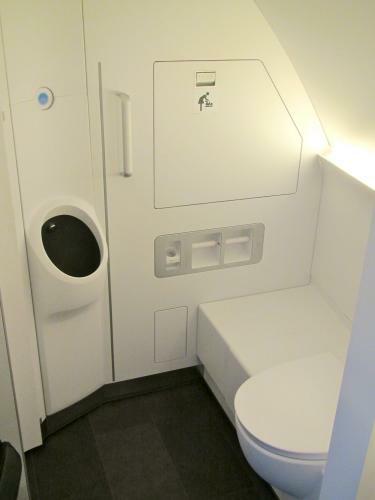 First class toilet and urinal– note the thoughtful handlebar to help maintain aim in turbulence. 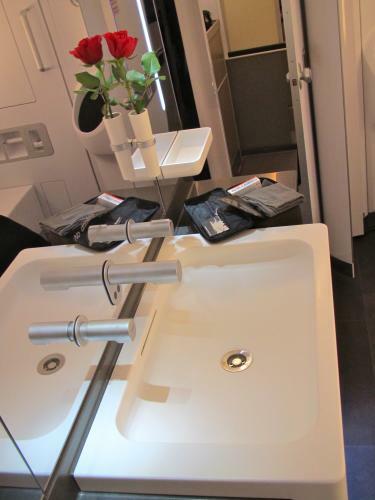 Now that’s a first class sink. 6) The A380 has three exterior cameras with awesome views that all passengers can access from their seatback video screens. Below are images of one camera mounted in the tail of the aircraft with a view of our departure gate at Frankfurt. Below that is the view from the bottom of the plane. As we landed at SFO around noon with the sun directly overhead, there was a perfect shadow of the A380 set against the brackish brownish waters of the bay. Gorgeous! Nice touch! Midway through the 11 hour flight between Frankfurt and SFO, flight attendants served cake and champagne to all passengers to celebrate the arrival of SFO’s first A380. If you are interested in digging in deeper or hearing other perspectives on Lufthansa’s big bird, check out the stories from fellow travel writers and bloggers who joined me on this trip: Brett Snyder, John DiScala, Stephanie Michaels, Harriet Baskas and David Armstrong.